Just another white bread, bulk was longer this time, almost 10 hours. 21 hs at the refrigerator. It was more easy to shape, but still difficult. Liked the result. Trevor's book is being really helpfully. Long time since I shared my breads here, was trying to read more than bake, trying to understand the dough at each stage of the prepare. The temperature here has increased a lot, my kitchen is always at 28-32 celsius degrees, day or night. The main problem I am having with my doughs are in shaping, it has been so hard to shape lately, sometimes the dough feels nice at the BF, holding shape nicely after the coil folds, but when I try to shape it become loosely, air escaping on the sides and cant hold the shape anymore. It is very difficult to move the dough to the banneton, but I do and when I bake it will turn in a disc, but well fermented bread because of the long retard at the refrigerator. Well, I'm reading Trevor's book, and seems like under fermentation is my problem. My starter is ok, my levain get ready in nice time, so I am not pushing BF enough or maybe I am unable to develop the dough structure with strenght. I need to read more, for sure. But yesterday I had a better result, it's clearly to me that this is a case of "fools crumb", still better than what I was having. Now let's get to what matters, how I did the bread of the pictures. Levain was build from 6g of starter, 3 feeds 1-1-1, 100% hydration. 1000g final dough, 68% final hydration, 2% salt, 10% levain. It's 100% white flour. I did a premix (flour, water and salt) at 6 am and put it in the refrigerator. At 1 pm I removed and let it rest on the counter. At 5:15 pm I added the levain, mixed very slowly to not break the gluten that was developed at the premix and started the coil folds. As the dough was holding shape already, I did folds with 1 hour interval aproximately, when the dough spreaded enough. At 10:40 pm it seemed the dough was fine, some bubbles on the surface, not sticking a lot and holding shape for longer time. Here I changed my plans, usualy I turn the dough on the counter and pre-shape using my bench knife and turning the dough in to a boule, but I decided to remove and pre-shape at the sametime using the coil folds. I put the dough on the counter and it holded shape nicely, 20 minutes and it almost not spreaded, so I decided I was not going to shape anymore, I just used the bench knife to try to create some tension scraping the dough on the sides and moved it to the banneton and to the refrigerator. At 8 pm of the next day I removed it to bake, it standed tall and firm after removing from the banneton in to the pan, it was really easy to cut. Baked for 20 minutes with lid, 25 without it, all at 250º C. At the temperatures of my kitchen, a BF of five hours seems more than enough to me, it's hard to believe it was under fermented, but I think I should probably let it BF for more time. I tried to get a strong flour last week, but I could not, I only found 25kg packages, which is a lot for me, hard to keep at home and I use only a little every weekend, I would end up losing a lot of that flour. So I found an organic flour that I had used a while ago and decided to try it again, I also found a different, non-organic brand, and I decided to make a loaf of each one of them. Interesting that the two brands claim to have 10% protein. The results, however, were very different. The organic was very easy to work, the other was almost impossible, since the mix I already realized that it would be complicated, did not develop gluten in any way and in the end did not hold shape, it was very difficult to get the shape and put in the banneton, The next day it stuck to the banneton and took a little work to leave. The bread looks well fermented, it just seems like it can not maintain a structure. I was very happy with the result of the organic, happy level dancing in the kitchen hahaha. Anyway, the pictures speak better than me and my poor English. The two loaves were my usual recipe, 1000g dough, 100% white flour, 65.03% water, 2.19% salt, 18.58% levain (100% hydration). Final hydration, 68%. Temperature in my refrigerator was about 3 ° C and in my kitchen during the day ranged between 25-27 ° C.
- Final proof for 13 hours in the refrigerator. Now that I've been able to protect the bottom of my loaves well, I'm trying to get darker crusts without burning the bottom. I still work with weak flour, the two loaves were my usual recipe, 1000g dough, 100% white flour, 65.03% water, 2.19% salt, 18.58% levain (100% hydration). Final hydration, 68%. Temperature in my refrigerator was about 9 ° C and in my kitchen during the day ranged between 21-24 ° C.
- mix (flour, water and levain) - 30 min "autolyse"
- put in refrigerator for 14 hours. - Final proof for 3 hours at the counter and 5 hours in the refrigerator, straight to the oven, bake for 20 min with lid and 35 without lid, temperature was 250º C from start to finish. I found it overproofed, the dough degassed a little when I cut, not much, but it was perceptible. The dough was strange when I took it out of the banneton, even though getting in the refrigerator was difficult to cut, it was kind of soft, very soft. The bottom held up well and did not burn, I thought it was even lighter than the rest of the crust, could have baked even more. I do not know if it made a difference in the taste, that bread went to my mother's house and I did not eat it. - put in refrigerator for 8 hours. - Final proof for 4 hours on the counter and direct to the oven, bake for 20 min with lid and 20 without lid, temperature was 250 ° C from start to finish. 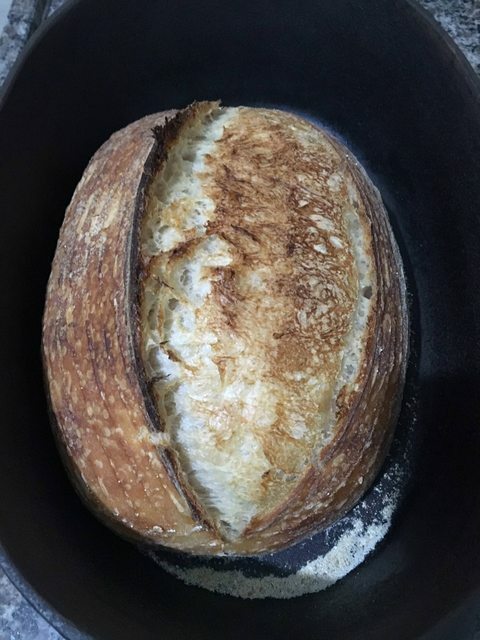 A friend came to visit us this weekend and said that he wanted to eat bread, so I had to speed up this bread a little so that it would bake before he left, as this one was baked first than the other, I used it to test how much it was going to change the bottom if I left the temperature at 250 ° C all the time. I let it cool for 1 hour and we cut it, it was very yummy and the crust was really very crispy. This bread had this strange opening again, as in my last post. Happy with the results and tests of this weekend, probably this week I will have strong flour again and there will be other tests. We had a holiday last Friday, so a longer weekend, I've never made so many breads! Still testing weak flours and also a new recipe with a little wholemeal flour. There were 6 breads, the picture above is only 5 because one had already given away to friends. There were 3 different methods, 2 loaves each, I'll explain each one briefly and put the results photos. 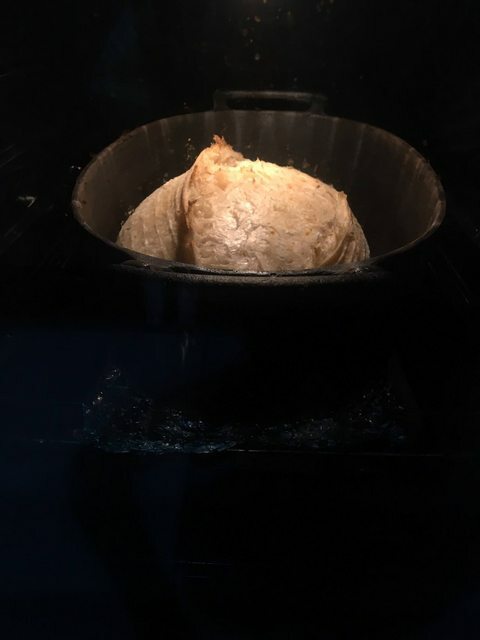 This weekend I tested a tip from Doc.dough in the other post, as he explained, I took an aluminum foil and kneaded it in a ball, opened it again and folded it in 4 layers, I placed it in the oven rack to protect the bottom of the pan . It worked very well! The bottom of my breads improved a lot. Thank you, Doc! These breads were my usual recipe, 1000g dough, 100% white flour, 65.03% water, 2.19% salt, 18.58% levain (100% hydration). Final hydration, 68%. The two that are not 100% white flour are the same %, only 10% of the flour is whole. Temperature in my refrigerator was about 5 ° C and in my kitchen during the day ranged between 24-26 ° C.
The oven and the pan were preheated to 250º C, the breads baked for 20 minutes with the lid of the pan and another 25 minutes without cover and oven at 230º C. It is longer than I left before, was trying to get a darker crust, could have baked for even longer, the bottom held up very well and came out not burned on all the loaves. The first loaves were made according to an idea that Doc.dough gave, the method I used that time was asking for 14 hours of refrigerator, so he wondered if it would really take all this time and what would happen if it was reduced to 4 hours. - mix (flour, water and levain) - 30 min "autolyse". - add salt and mix (rubaud). - 4 stretch and fold every 30 min. - after 2 and a half hours of the mix, put in refrigerator for 4 hours. - remove, pre-shape, bench rest 20 min, shape. - final proof at the counter was 4 hours for first dough and 4 hours for second, the second dough was an hour more in the refrigerator. The next batch was the breads with a little whole wheat flour. The method was as follows. - mix (flour, water) - 30 min autolyse. - stretch and fold every 30 min, 6 times. - pre-shape, bench rest 20 min, shape. It was 6 hours of bulk fermentation. - 1 hour rest at the counter and then put in the refrigerator for 14 hours. - I removed it straight from the refrigerator to bake. The second dough stayed for an extra hour in the refrigerator. The last batch were 100% white flour bread, same method from my last post. - put in refrigerator for 14 hours, second dough was an hour more. - in the final proof I had to improvise, I had to leave for a lunch, then the dough that was the longest outside the refrigerator and was well developed, I put back in the refrigerator, the second I decided to leave on the counter and bake first when I returned, it was a total of 5 hours at the counter until baking. The one that went back to the refrigerator was 3 hours off, another 4 hours in the refrigerator and straight into the oven. It was very difficult to fit so many loaves into my holiday and weekend schedule, but I succeeded and was very happy with the results. The first batch was very dense, so I think actually the 14 hours in the refrigerator make a lot of difference, at least when I use weak flour. The other breads were very good and especially the 6th bread I found it was even better than the others. Sorry for the long post. I hope it did not get too confused. I'm from Brazil and first I need to explain something about the flours here. For some time I've been making bread with a good flour that I bought in Paraguay, the best bread I've made until today was made with that flour, but it was over and I still could not buy more, so I had to use the best flour we can find in the markets here (there are better ones, but very difficult to find). There is no quality control and there are no different types of flour, as you have in the US or Italy and others, all the flours I have seen here present information that they have 10% protein. That's true? I do not know, there's no control. What I know and what many amateur and professional bakers know is that flours here can not withstand high hydration, even with 68% hydration it is very difficult to work with. 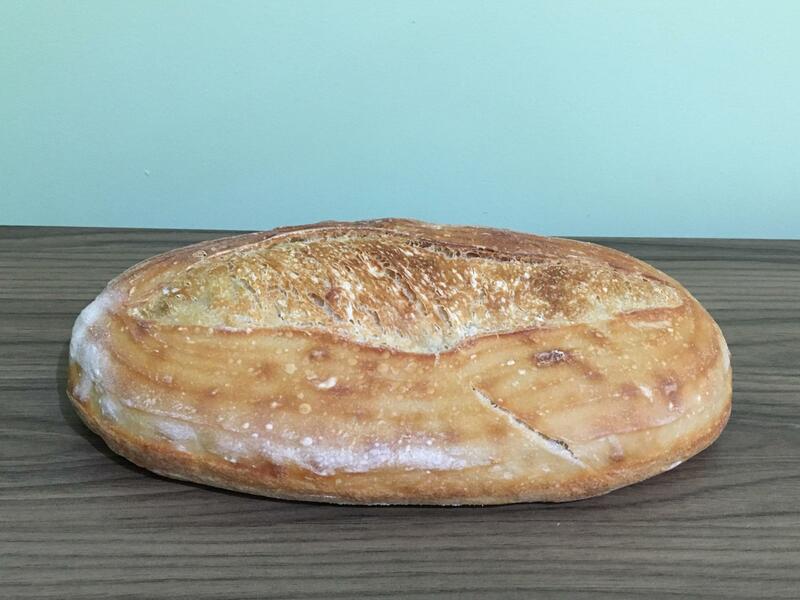 So using this flour and after Kat's tip about Matteo Festo's book, I decided to test a different method to see how the result would turn out and the differences in working the dough with this Brazilian flour. These breads were my usual recipe, 1000g dough, 100% white flour, 65.03% water, 2.19% salt, 18.58% levain (100% hydration). Final hydration, 68%. Temperature in my refrigerator was about 5 ° C and in my kitchen during the day ranged between 20-22 ° C.
The recipe in the book asked for a higher percentage of levain, but I ended up forgetting and had to improvise. As the final proof would be at the counter I decided to keep the levain of my formula and adjust the time of final proof as the dough developed. My impressions: the dough came out of the refrigerator very soft, easy to work, was definitely my best shape. I think I might have left more time at the counter, but I was afraid to overproof. It had been a long time since I had baked straight from the counter, it was harder to cut. My cuts are never unique, I can cut straight through almost to the other side, but when I get close to the other end the blade fails, the difficulty is because I cut into the pan that is very hot. I think it was a good result, I found the crust more crunchy. I got results similar to the ones I have with my normal method, but it definitely was a lot easier to work these doughs this time. The first loaf is the top loaf in the picture. The photo of the crumb is from the second bread. The first one I gave to friends and they still did not send me the picture of the crumb (yes, I asked them to take a photo, which was weird hahaha). 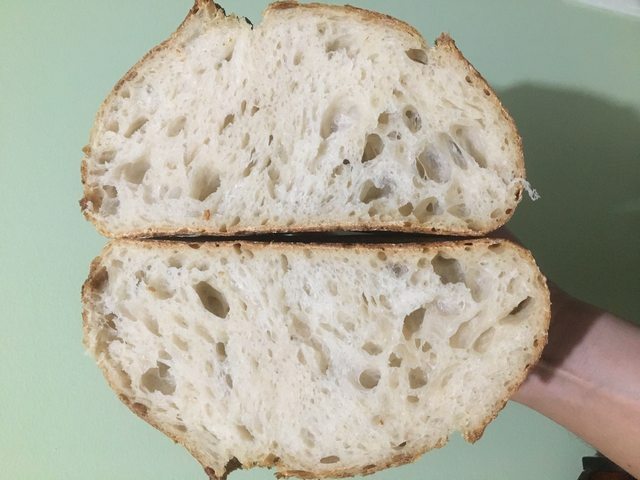 It's clearly underproofed, dense crumb, the ear broke (I think in another post someone told me that this was a classic sign of underproofed dough) and not so great oven spring. Lots to learn about temperatures yet.